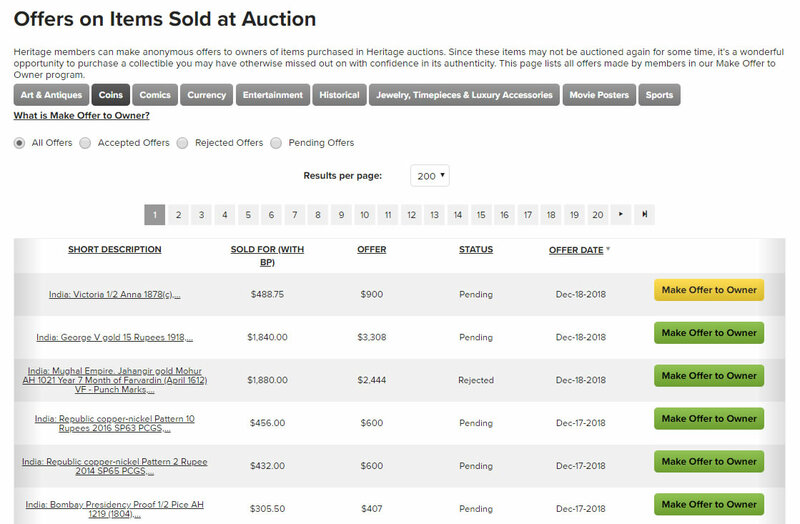 Heritage Auctions’ Make Offer to Owner (MOtO) program, through which clients can make anonymous offers on lots previously sold at auction, has added an extremely useful new feature showing the amount and status of every resale offer ever made via HA.com. Any Heritage member who sees a previously auctioned item of interest with a Make Offer to Owner button has the option of submitting an offer, after which the item’s owner can accept or decline the offer, or submit a counter-offer to the potential buyer. The new Make Offer to Owner Archive is sortable by Category as well as by Accepted, Rejected and Pending status. The Archive includes every MOtO offer made via HA.com since the feature was introduced first in 2009, with the most recent offers appearing first. "This new, permanent archive increases our already market-leading transparency," said Heritage Auctions Co-Chairman Jim Halperin, "and we hope it will encourage more MOtO competition on previously auctioned items by showing pending offers in one convenient place. Just type ‘HA.com/moto’ into your browser to access the main MOtO Archive page anytime, then pick a category and refine the list to see Pending, Rejected, Accepted or All offers. Our members will be amazed at how much information they can glean by accessing their favorite categories on a daily basis. Every listing includes a link to the entire item page. Members are encouraged to outbid any and all pending MOtO offers if they would pay more for that item than the pending high offer."